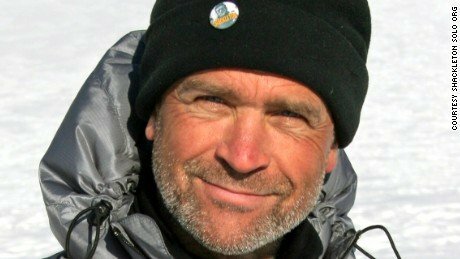 In a sad story we have been following, the British explorer attempting the first solo crossing of the Antarctic has died after being airlifted to a hospital. Henry Worsley had received a royal sendoff from Great Britain when he announced his plan to be the first man to cross the Antarctic continent alone, more than 900 miles, by skiing. More than 70 days later and he remained just 30 miles from his goal. In an audio message Worsely recorded two days before he died, his voice sounds healthy but resigned. He found himself tent bound against driving snow and soft powder making it impossible to move forward. Sadly, just 30 miles short of his goal, the 55-year-old succumbed to exhaustion and he called for help. He died shortly later at a hospital from peritonitis, according to the NY Times. Peritonitis is the inflammation of the tissue surrounding the abdomen. A statement on his website confirmed he had died of organ failure. News of the adventurer’s death spread quickly. Prince William said that he would be missed and honored. “We have lost a friend. He was an inspiration to us all,” the prince is quoted as saying. The journey was not in vain as Worsley raised nearly $100,000 for the Endeavor Fund to help his wounded colleagues. Worsley had made two previous journeys across different portions of the Antarctic with other people. One in 2008-2009 traced Shackleton’s original voyage. There was another in 2011 before his latest attempt this year. Worsley began his trip in November. So while most people visiting with family, enjoying the holidays, Henry Worsley was trekking through unforgiving terrain battling minus 40 degree winds at elevations of 9,000 feet. Some might wonder why he would pursue such a journey? And that might be worthy question given the outdated nature of such a physical land journey. But it will always be great physical tests of will that forever drive people. It’s just something they have to do. The descendant of Frank Worsley, a member of Ernest Shackleton’s crew in his ill-fated journey, Worsley felt it his calling to test the endurance of what he was capable of accomplishing. Unfortunately his fate was, in the end, one for the ages.